I have a hand-stitched Cathedral Window quilt that I call my "Forever Project", since I figure it's going to take me FOREVER to finish, if I ever do. Since it's a hand-stitched project, it's completely portable and I take it with me whenever I know I am going to have a substantial amount of downtime ... doctor's appointments, Little League games, road trips. One time, one of my daughters wanted me to accompany her to my hairdresser's upon the occasion of my daughter having highlights put in her hair. Well, I was briefly between projects lately and I decided that, while I certainly wasn't going to give my CW quilt to my hairdresser, I could make her a CW pillow. After all, she has taken really good care of me for years. So, I scaled down my CW block to be appropriate for a pillow and decided that I would make a 3x3 block of CW squares and float this block onto a backing, which would be the front of the pillow. I further decided that, since I could (and had the instructions to do it), I would make the entire thing by machine (as opposed to entirely by hand, as my quilt is). If figured it would go more quickly that way. I even put in an extra piece of subtly coordinating fabric in the areas between the window panes, as an extra dollop of color. You *do* know what They say about the best laid plans of mice and men? Exactly. This one went awry. The first part of machine stitching went quite wonderfully. I was about to stitch down the center, colorful window panes when I realized that due to the small size of the square, machine stitching the bias folds over the top of the window pane just was NOT going to work nicely. The machine stitching looked horrid. (In my defense, when I did these blocks in a larger size, the machine stitching of this final step worked very well.) So, I took out the machine stitching and finished off all the window panes by traditional hand-stitching. It really didn't take *that* long after all. Back home, I cut the muslin for the pillow cover front & back, sewed my CW block to the front piece, finished the edge of the pillow with another line of piping and popped in the pillow form. Ack! 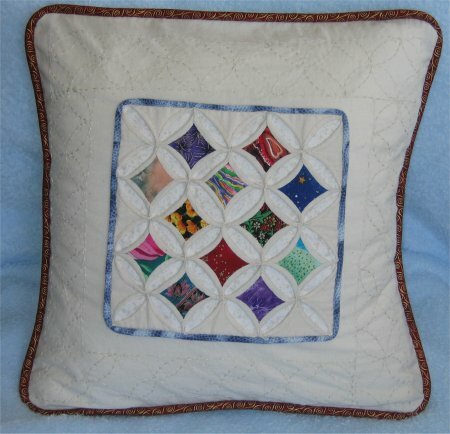 The CW block which would have looked wonderful on a 12"x12" pillow now looked waaaaay too small on the 14"x14" pillow. I had 3" of border all around the CW block and it looked very, very, very blank. I was not a happy stitcher. Thinking of solutions, I could have added another row and column of CW squares, but then I would have had to remove the piping .. and I didn't have any more of that fabric to go around the larger CW block .. so that option was out. What do do? What to do? Well, I then decided that I could put some embroidery in the border area. I made up a CW outline template to fit the size of the border, lightly transfered the outline to the borders of the pillow and did a simple running stitch by hand. Then, upon closer inspection, I realized that the corners of the extra pieces of fabric I had put in between the window panes were not adequately covered. If she ever washed the pillow cover, those corners would fray and pull up. Completely unacceptable. So, I stitched some unobtrusive hand tacking in each corner. Of course, I didn't think of this BEFORE I put the pillow cover together ... all this had to be done AFTER the pillow cover was completed! But, I think it turned out rather nicely in the end. She then told me that the ecru color of the pillow front would *exactly* match her couch .. and the red/gold fabric I used as the outer piping coordinated EXACTLY with the throw pillows she already had! I couldn't have picked a better match if I had known what her decor was like. And I tell you, I did agonize over what fabric to use for the piping. She's promised me she would take a picture of the pillow on her couch so I can see it. All in all, for the short amount of time that this pillow actually took, this was one of the best reactions I've had. And while I know that you shouldn't give a gift for the reaction that you will (or won't) get, I'll be the first to admit that I *do* like to see my recipients enjoy what I've made for them. A lukewarm reception doesn't give me the feedback that I like ... but Cindy's response keeps me wanting to give again.